Bed skirts are essential for your Twin XL dorm bed. The right college bed skirt will add style to your entire dorm room. At DormCo, we offer a variety of colors and styles of dorm sized and extended bed skirts to perfectly match your extra long Twin bedding and your college decor. And your dorm bed skirt becomes even more essential when you need to use the space underneath your Twin XL bed for storage. A stylish college bed skirt will help hide your dorm underbed storage, leaving your dorm room looking exceptionally clean and organized! Dress up your dorm bed with this dorm bedding accessory Twin Xl Bed Skirt. Dress up your dorm bed with this Dorm Sized Bed Skirt Panel with Ties - Black. Dress up your dorm bed with this Dorm Sized Bed Skirt Panel with Ties - White. Dress up your dorm bed with this Dorm Sized Bed Skirt Panel with Ties - Silver Birch. Dress up your dorm bed with this Dorm Sized Bed Skirt Panel with Ties - Alloy. Dress up your dorm bed with this Dorm Sized Bed Skirt Panel with Ties - Jet Stream. Dress up your dorm bed with this Dorm Sized Bed Skirt Panel with Ties - Rose Quartz. Dress up your dorm bed with this Dorm Sized Bed Skirt Panel with Ties - Glacier Gray. Dress up your dorm bed with this Dorm Sized Bed Skirt Panel with Ties - Hint of Mint. Dress up your dorm bed with this Dorm Sized Bed Skirt Panel with Ties - Limelight Yellow. Dress up your dorm bed with this Dorm Sized Bed Skirt Panel with Ties - Orchid Petal. Dress up your dorm bed with this Dorm Sized Bed Skirt Panel with Ties - Nightfall Navy. Dress up your dorm bed with this Dorm Sized Bed Skirt Panel with Ties - Smoke Blue. Dress up your dorm bed with this Dorm Sized Bed Skirt Panel with Ties - Purple Reign. Dress up your dorm bed with this Crinkle Dorm Sized Bed Skirt Panel with Ties - Silver Birch. Dress up your dorm bed with this Crinkle Dorm Sized Bed Skirt Panel with Ties - Alloy. Dress up your dorm bed with this Crinkle Dorm Sized Bed Skirt Panel with Ties - Rose Quartz. Dress up your dorm bed with this Crinkle Dorm Sized Bed Skirt Panel with Ties - Glacier Gray. Dress up your dorm bed with this Crinkle Dorm Sized Bed Skirt Panel with Ties - Hint of Mint. Dress up your dorm bed with this Crinkle Dorm Sized Bed Skirt Panel with Ties - White. Dress up your dorm bed with this Crinkle Dorm Sized Bed Skirt Panel with Ties - Black. 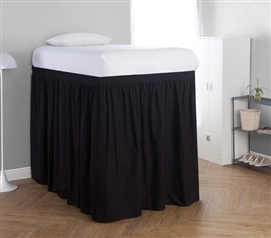 Dress up your dorm bed with this Extended Dorm Sized Bed Skirt Panel with Ties - Black. 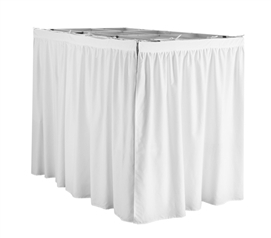 Dress up your dorm bed with this Extended Dorm Sized Bed Skirt Panel with Ties - White. Dress up your dorm bed with this Extended Dorm Sized Bed Skirt Panel with Ties - Silver Birch. Dress up your dorm bed with this Extended Dorm Sized Bed Skirt Panel with Ties - Alloy. Dress up your dorm bed with this Extended Dorm Sized Bed Skirt Panel with Ties - Jet Stream. Dress up your dorm bed with this Extended Dorm Sized Bed Skirt Panel with Ties - Rose Quartz. Dress up your dorm bed with this Extended Dorm Sized Bed Skirt Panel with Ties - Glacier Gray. Dress up your dorm bed with this Extended Dorm Sized Bed Skirt Panel with Ties - Hint of Mint. Dress up your dorm bed with this Extended Dorm Sized Bed Skirt Panel with Ties - Limelight Yellow. We not only offer different sizes, styles, and colors of college bed skirts, we also give you the option to choose how much of your dorm bed you want to cover. Choose between our full Twin XL bed skirts or our dorm bed skirt panels with ties to perfectly cover the space between your Twin XL sized bed and dorm room floor. Your extra long Twin bed skirt will help add style to your college decor while hiding your underbed storage from anyone that comes into your dorm room.